Atlantis! Just the name congers up all types of myths and legends. Mysteries and opinions. For some, the very thought that it even existed is considered a joke. To others, the fact of its reality is without question. Shrouded in the mists of ancient history, before known records, Atlantis still has an influence on our imaginations today. 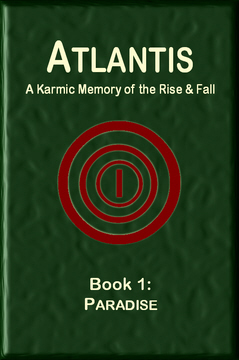 In this book, Atlantis: "A Karmic Memory of the Rise & Fall", an idea is introduced. The idea that Atlantis was not only real, but that someone who was there, has detailed memories of what it was like. Not only personal memories, but memories mixed with a channeled connection to the energy records that dwell in a place out of space and time. These records are called "mass consciousness" by some, "Akashic Records" by others and more names by many others. Whatever the name, the idea is the same. Energy can not be destroyed and the energy of information gleaned from all experience is held in some form of records that adepts of all kinds have been known to access. When Zarin approached me with the first pages of manuscript for this book, I was intrigued. I began to read as he described his memories of a time before recorded history that contained facts and insights that stretched my imagination, yet crushed some cherished conceptions. Whatever your belief is, concerning Atlantis, this book is likely to catch your interest as a detailed vision of the creation, the finding, the building and the destruction of the place known as Atlantis. Much of what is contained within these pages flies in the face of much popular theory, yet offers explanations of many misunderstood discoveries of recent times as well as many that are about to come to light. "Atlantis: A Karmic Memory of the Rise & Fall" lays out answers to many questions about what Atlantis was, what was it like? where was it? what went wrong? what happened to it? and why do we not have any evidence of it today that we can recognize as such? This history of Atlantis is being released in four e-books. This is the first Book entitled "Paradise". Is the information provided here real, or an imaginative journey through the mind of its author? You will have to decide that for yourself. Read, enjoy, and keep an open mind. Atlantis: A Karmic Memory of the Rise & Fall is currently available here.